I'm going to be frank. Between all the handgun options, determining the best way to carry, finding the time (and money) to take concealed carry permit (CCP) courses and the sheer anxiety of becoming a full-time concealed carrier takes, it can easily become overwhelming to the newcomer. But I'm here to tell you, we've come a long way, ladies. The surge in women's interest in firearms began increasing in the 1980s, when women began entering previously male-dominated professions like law enforcement and corporate America. As women became more independent, taking control of their careers, finances and living arrangements, home defense and personal protection became an increasing concern. Now, nearly 40 years later, the market is saturated with products geared toward women - and we're not just talking about a pink camo Cerakote, either. The influx in gear, resources, guns, and support has been tremendous. While this is a good thing, it has also left some women paralyzed; unable to effectively deduce exactly what they need to be successful. Your Handgun Needs to Fit Your Hand and Your Method of Carry. I can't tell you how many times I've been asked, "Which handgun should I buy?" My answer is always the same: whichever one fits you best. Think of your handgun like a great pair of shoes; you don't need to fit into a killer pair of pumps, they need to fit you or you'll end up clomping around like a drunk moose on an ice rink. With so many great choices out there; Smith & Wesson M&P Shield, Walther PPQ SC, Sig Sauer P365, Ruger LC9s, Glock 19, your biggest problem is going to be narrowing down which one to choose. Grip is key so I highly recommend actually shooting a gun before you buy it. If you can't, you at least need to hold it and handle it to make sure it fits your hand and feels good in your grip. Don't overthink it; the gun that you hold comfortably and shoot effectively is exactly the right choice for you. Head to our website and easily shop all firearms to see every holster option we can handcraft for you. 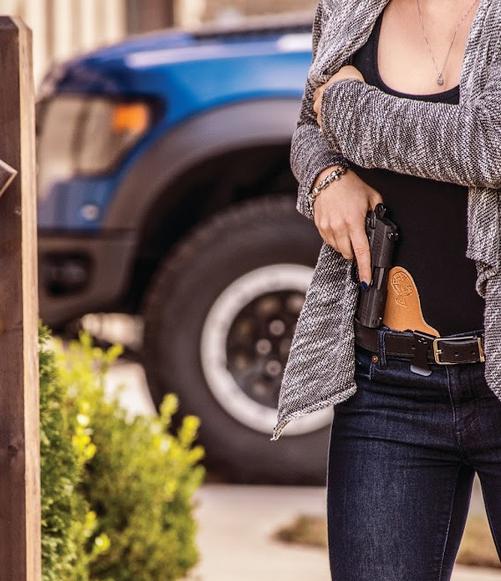 Some of our top sellers with female gun owners are the Designer Series Belly Band Package with Bedside Backup, the MiniTuck IWB Holster, the Purse Defender and the new Reckoning Holster which can be used strong side, appendix and cross draw. Secure your inside the waistband (IWB) or outside the waistband (OWB) holster with a sturdy gun belt. 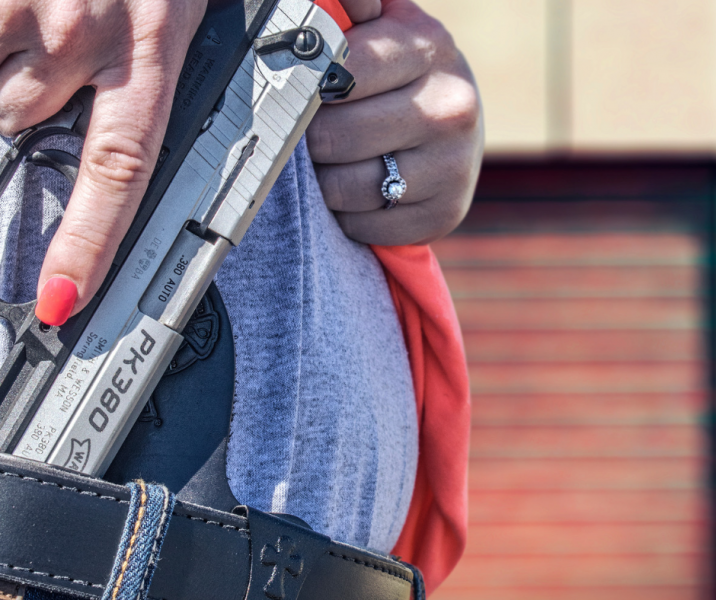 Our Executive and Ladies' Reversible Belts will ensure your holster will stay snug on your hip, no matter what you find yourself doing. When relaxing at home, easily store your modular holster in a Tactical Walls end table or shelf unit to ensure you'll have safe access to your firearm if and when you may need it. Heading to bed? Simply detach your Pac Mat from your Belly Band and place it on the Bedside Backup to ensure your gun is within reach overnight. You can't always take your gun with you. If you're out and about and need to go into a gun-free zone, make sure you're not making it easy for criminals to get their hands on your firearm. The Hornady RAPiD Vehicle Safe is a great option for every gun owner and our Pac Mat Holster fits snugly inside. Plus, it's an affordable option of securing your firearm - MidSouth Shooters has them on sale for $158.99. As Pat Rodgers once warned me, "Shooting is a perishable skill." The best way to be proficient and gain confidence is to hit the range frequently. A great way to do this is to keep a range bag at the ready. Having a good range bag is key. I like the Arsenal Handgun Range Backpack from Allen. It equally distributes the weight of its contents across its two beefy straps, provides plenty of room for all my gear and guns, looks great and is a solid option. For more intense range sessions, I tote my Brownells Range Bag packed with everything I might need like a tourniquet, my UpLULA mag loader, Chapstick, ponytail holders, a Sharpie, lens wipes, Hoppe's 9, band aids, Tylenol, extra ammo, hand wipes, eye and ear pro, and a pen and paper. If you can carry it, this range bag can handle it! Please protect them each and every time you shoot! The industry is filled with everything from blinged-out cans to prescription aviator glasses, so there's no excuse to not have eye and ear pro. A great option I recently discovered are Super Leight Women's Foam Earplugs from Howard Leight. They're designed for smaller ear canals so they're super comfortable, reusable and they come with a great little carrying case. At 14 pairs for as low as $3.97 at Rural King, what's not to love? If you're looking for a pair of muffs, definitely look for products with a 28 to 31 NRR. While some shooters like passive muffs (best for indoor shooting), I prefer electric cans but that's simply a matter of personal preference. From Radians Women's Shooting Glasses to my personal favorite, Oakley SI Ballistic M-Frame 2.0 Shooting Glasses, it all depends on what you're looking for and sometimes more importantly, what you can afford. The bottom line is - as long as they meet the American National Standards Institute standard (more on that here), you're good to go. Range time is fun. How about making it even funner?! Here's an easy option: Action Targets new game series paper targets. Get competitive with this line of creative targets that let you compete against other shooters or on your own with carnival games, arcade games, baseball, croquet and more! Heading outdoors? Triumph Systems' Pop Packs make for great summer fun! They come in a variety of shapes and colors and are great for practicing 'call-out' drills. Not all bullets are created equal. You'll need to purchase practice ammo as well as ammunition specifically designed for self-defense. A great option for practice ammunition is Wolf Ammo. It's cheap and I've never had a problem getting my hands on them or running them through my guns. 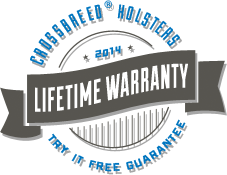 As for self-defense bullets, two great options are Hornady Critical Defense and Sig Sauer Elite Performance. It's important to choose the right ammunition because regardless of the caliber or brand of weapon you carry, the bullet alone is responsible for stopping an attacker. Many women start out eager to buy a gun and intend to begin carrying immediately. Unfortunately, that’s rarely how it works in real life. It’s okay to take your time, especially if it means being comfortable and proficient with your Every Day Carry (EDC). 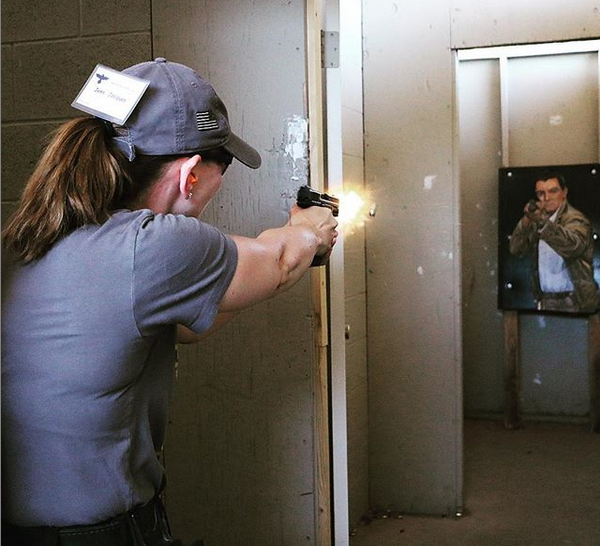 Keeping up with training will help boost your concealed carry confidence level and make you a more effective concealed carrier. Fortunately, between the expanding number of female gun owners and women in executive positions in the firearm industry, national groups like the Well Armed Woman, A Girl and A Gun, the Pink Pistols and Operation Blazing Sword are able to help connect and empower women and other emerging groups of new gun owners. These organizations continue to provide guidance and training to ensure women become efficient, effective concealed carriers. This is a lot of information to digest but if you take it step by step, you'll get there. Just remember: this is a marathon, not a sprint. You've taken the first steps into the fray so don't stop now, you're well on your way! We will continue to do our part by continuing to post reliable information you can count on! Jenn was born and raised in a big family in rural Northern Wisconsin — learning about firearm safety, hunting and fishing from an early age. She is the daughter of a great hunter, a wife, a mother, a Visiting Fellow with the Independent Women’s Forum, a former editor for Bearing Arms, and a “good gal with a gun.” She frequently appears on NRA TV, has been covered by Townhall.com, the Washington Post, and Women’s Outdoor News. Jacques is an active and ardent supporter of the Second Amendment, an outspoken concealed carry advocate, and an avid outdoorswoman. She can be found on Twitter, Facebook and Instagram.